Uh oh. After a run of positive news for the recorded music industry of late comes a reminder today (March 21) that this business can still deliver some troubling figures now and again. In this case, it’s the trade revenues (ie. wholesale cash going to labels and artists) of the UK recorded music industry for 2018, which have just been announced by local trade body the BPI. The headline stat: total revenues delivered to record labels and artists across all formats in the market grew by just 3.1% in the year, up from £839.5m to £865.5m. That represented a significant slowdown from the 10.6% rise seen in the prior 12 months. And to make matters worse: according to the Bank Of England, annual inflation stood at 3.3% in 2018. 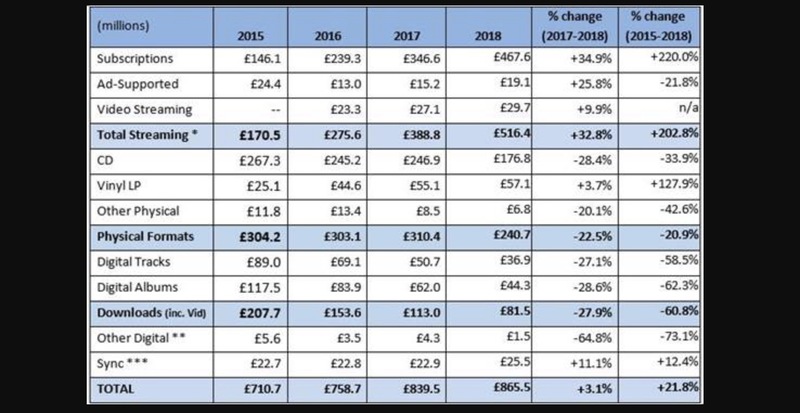 This means that, with inflation factored in, that £839.5m in 2017 trade revenue was actually worth the equivalent of £867.5m in 2018 – ie. more than the £865.5m generated by the business last year. There are some mitigating factors here. For one thing, 2017 saw the record-breaking release of Ed Sheeran’s Divide album, amongst other highly successful records, which resulted in a tough market comparison for 2018 to live up to. In addition, 2018 was a significant year in terms of the industry’s transition away from physical purchases. According to the BPI’s stats, taken from its new 2018 ‘All About The Music’ Yearbook, wholesale CD sales last year fell by a painful 28.4%, down to £176.8m. And total physical revenues fell by 22.5% to £240.7m. It was an even worse year for the humble download: digital tracks dropped 27.1% year-on-year to just £36.9m, while digital album downloads tumbled 28.6% to £44.3m. The biggest bright spot was, unsurprisingly, streaming. Subscription streaming revenues leapt up 34.9% to £467.6m, making up over half (54%) of total trade revenues. Ad-supported audio streaming revenues, meanwhile, grew 25.8% to £19.1m. Revenues paid out by video streaming services grew by 9.9% to just £29.7m – which was less than both the money paid to labels from sales of vinyl (£57.1m) and digital track downloads (£36.9m). 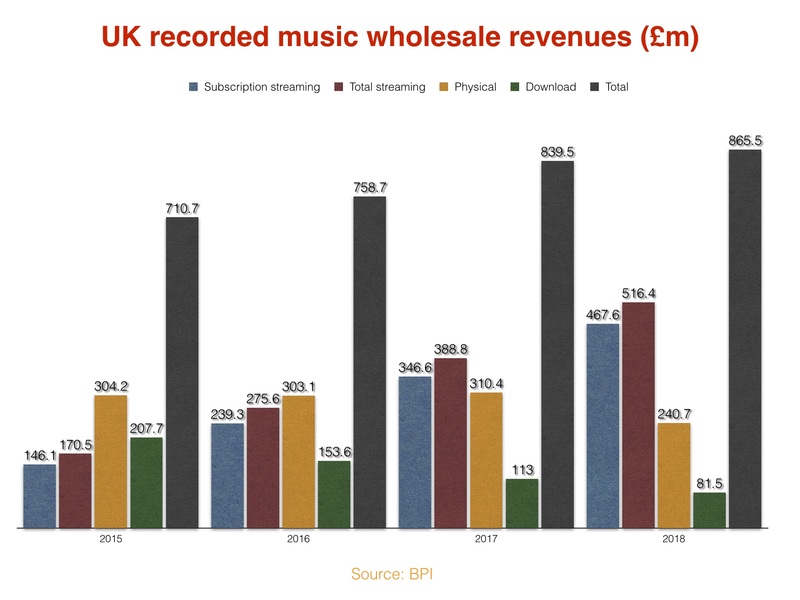 An evolutionary year for the UK, then, with the drop-off in physical and digital music sales dampening the positivity surrounding growth in subscription streaming. Some experts now predict that streaming growth in Europe (including the UK) and the United States is going to start to slow in 2019. Question is: what will that mean for the state of the British market overall? Particular food for thought for UK labels: their colleagues over in the USA enjoyed a 11.9% rise in wholesale recorded music industry revenues in 2018.